The Gordini Fall Line II Gloves are one of the best. They consistently become one of the best sellers due to their style, comfort and warmth. The shell is designed with a 3 Layer Thermal Ply waterproof, windproof and breathable fabric. This greatly ensures that your hands and fingers are super warm and cozy even in the chilliest of winter temperatures. To help keep the heat inside is the Megaloft Insulation. When combined with Hydrowick, you'll have warm and dry hands as Hydrowick helps wick moisture away from your hands and allows it to evaporate. 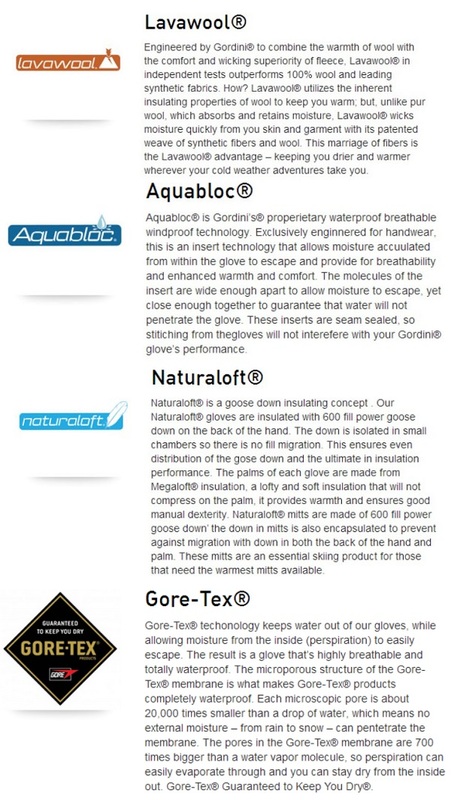 There's an Aquabloc Insert which increases the breathability, waterproofness and windproofness of the gloves. Some additional fun features on these Fall Line II Gloves are the Stick-Grip Fingers and Digital Grip Palm and Reinforcement which will keep you hanging onto chairlifts or poles without a problem. Lots of warmth without the bulk and technology to ensure warm, comfy and dry hands makes the Gordini Fall Line II Gloves ideal for any gal who loves the mountain. 3 layer thermal ply waterproof, windproof, breathable fabric, stick-grip fingers, wrap caps and thumb with digital grip palm and reinforcement. Megaloft®, Aquabloc®, gauntlet cinch closure, nose wipe, wrap caps, palm and thumb reinforcement.